This page presents a solution to deploying Microsoft Security Essentials unattended by repackaging the 32 and 64 bit setup files into one Windows Installer (MSI) format file. The problem with Group Policy deployment is that the installation of Microsoft Security Essentials is not in MSI format, which is a requirement. 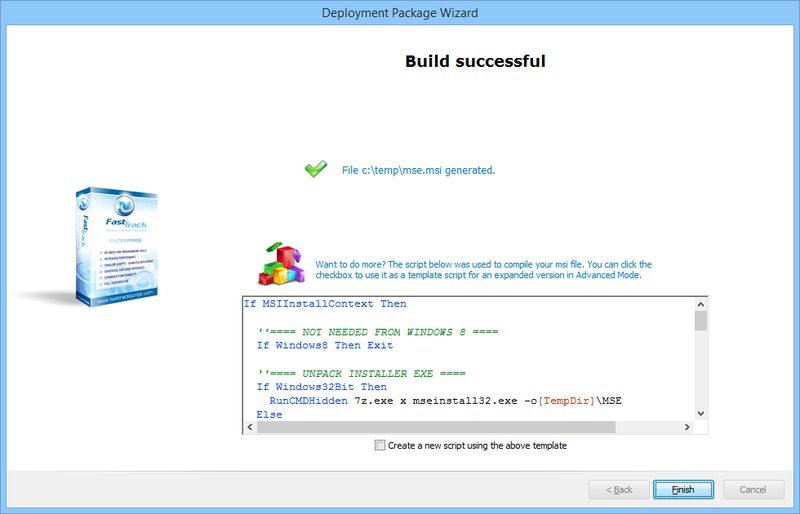 This page will go through how to convert the installation to MSI format without using unreliable snapshots. You can also deploy without repackaging at all. Read on for details. Similar articles exist for TeamViewer, MalwareBytes, AVG and Avast. Please note that Microsoft Security Essentials is currently allowed only for personal use and home based businesses PCs, but conditions may change. You are responsible for checking whether you fulfill the current conditions to use Microsoft Security Essentials for your purpose or not. 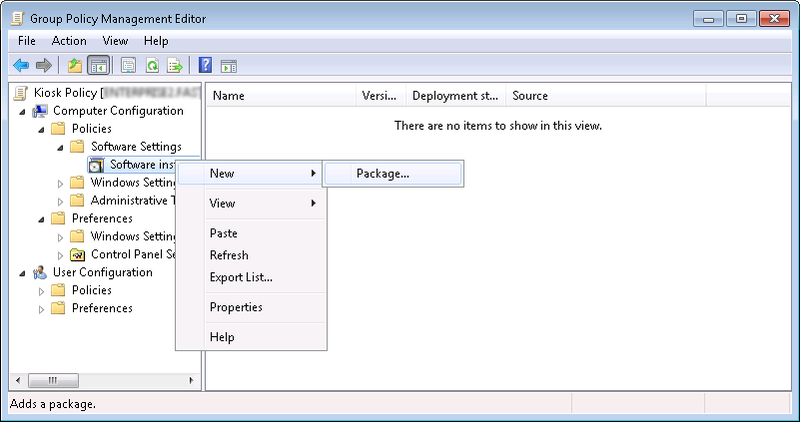 On the second page of the wizard, the type of output package must be selected. 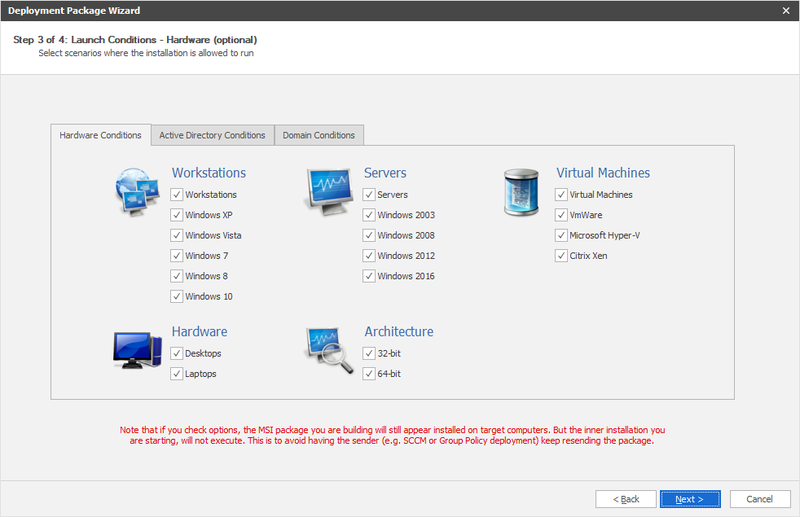 Here we must select Microsoft Security Essentials in the list. There are templates for TeamViewer, Avast, AVG, MalwareBytes and Microsoft Security Essentials, but you can repack any type of installation using the top two options; see instructions for this further down this page. The templates options are basically just extended versions of the generic EXE-to-MSI, which is the first option in the list. The current setup file must be downloaded from this link. 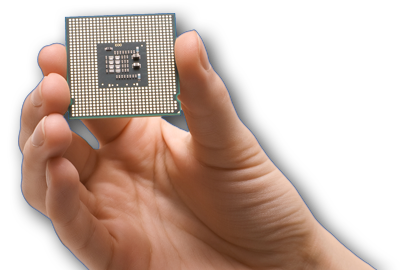 Download both the 32 and 64 bit setup file. The downloaded file is named "mseinstall.exe" for both 32 and 64 bit. Download and rename the 32-bit version of "mseinstall.exe" to "mseinstall32.exe" and download and rename the 64-bit version of "mseinstall.exe" to "mseinstall64.exe". Next, place these two exe files in the directory that you specify as the setup file directory. The wizard will look for these two files in this directory. At this point you need to decide, how to deploy Security Essentials. You have two options. One is to continue the wizard and you end up with an MSI file. The other options is to use the checkmark at the bottom. 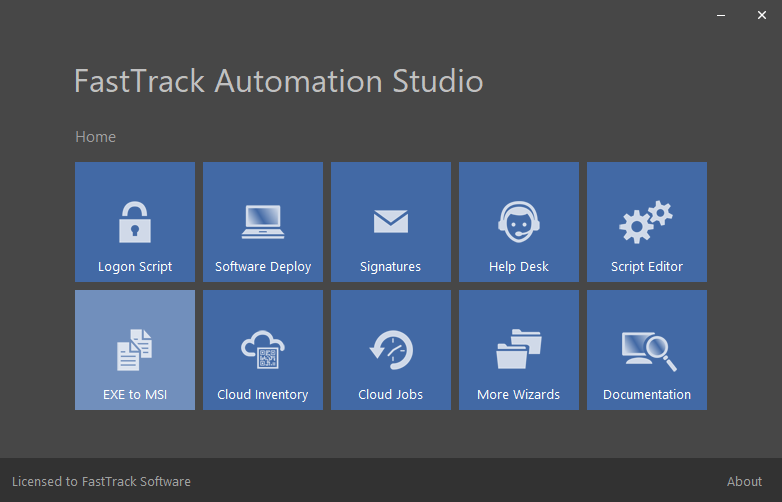 FastTrack Automation Studio can actually deploy software without a central management system. If you tick the checkmark, the wizard will save the generated script files instead in the folder, where you have the Security Essentials setup file. 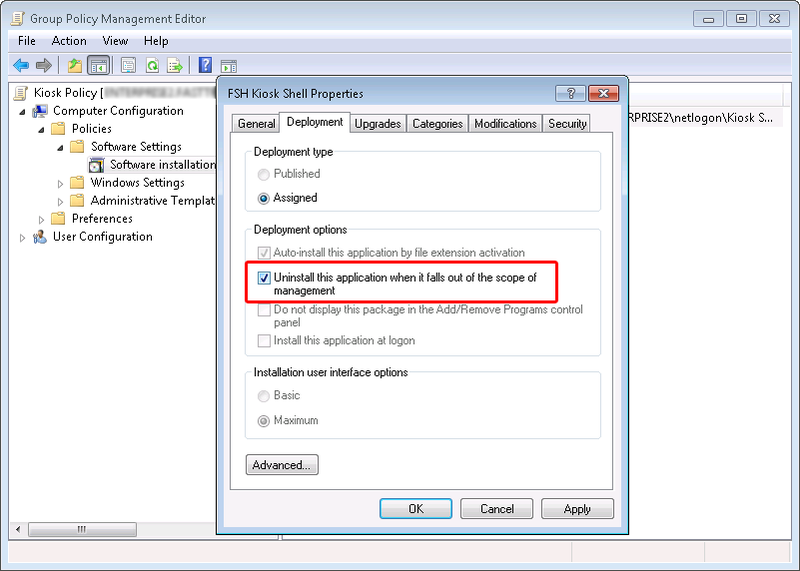 Then you can click the "Software Deploy" icon in the Home Screen and simply point to the script file instead using the "Add FSH" button shown in the screenshot below. Refer to this page for more information on automated software deployments. Clicking next will show launch condition options. These options allows you to prevent installation of Security Essentials on certain computers, such as servers. This means that you can deploy the package to an entire OU or container in your Active Directory with Group Policies and avoid having it install on for example servers and virtual machines. To understand how launch conditions can actually work with Group Policies, we have to look at what the wizard does. 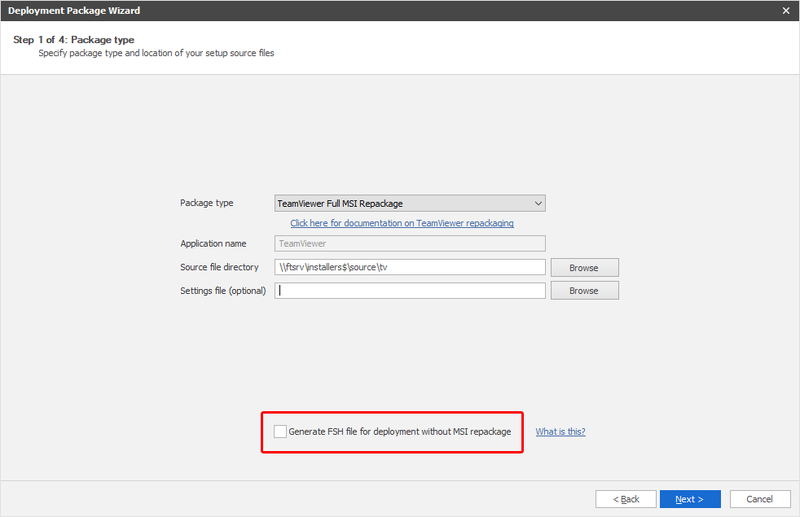 There are generally four scenarios to create MSI files with FastTrack Automation Studio, as shown below. What we are doing here is using the option to the left. 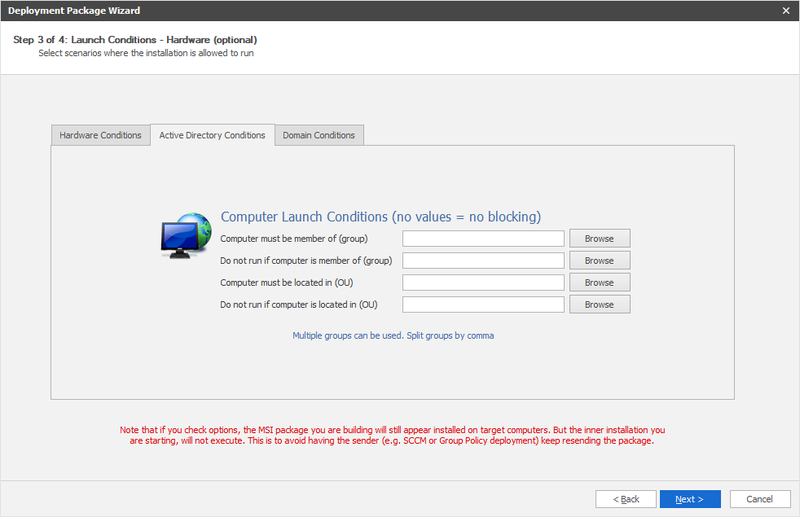 The MSI that wraps around the Security Essentials setup files is always installed, but it does not do anything other than register as an program in the Windows programs list, if it hits a launch condition blocking. 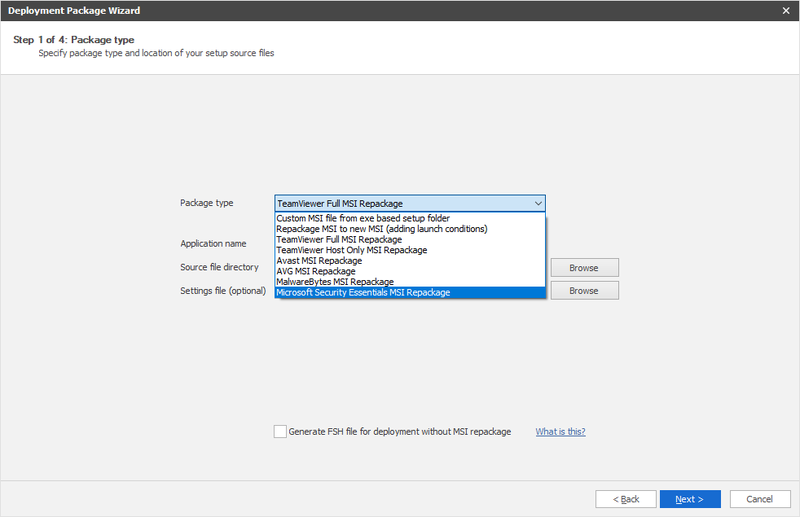 This means that from the point view of Group Policies or SCCM, the installation is always successful and will therefore not try to resend the MSI file. 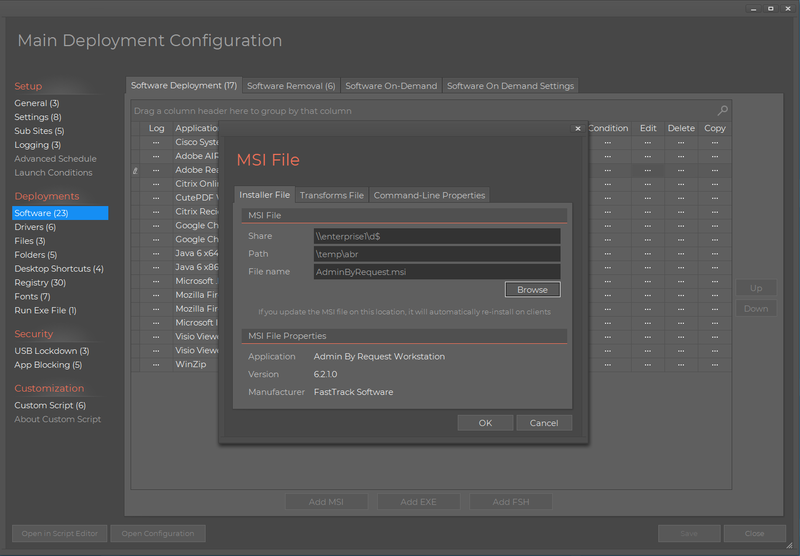 This is why there was also an option on the first page to use a setup MSI file inside the controller MSI, because then you can let the controller MSI always install, but only install the setup MSI on certain conditions, essentially allowing you to deploy all your software to all computers using Group Policies. Clicking next in the wizard after launch conditions will ask you for name of the output MSI file. 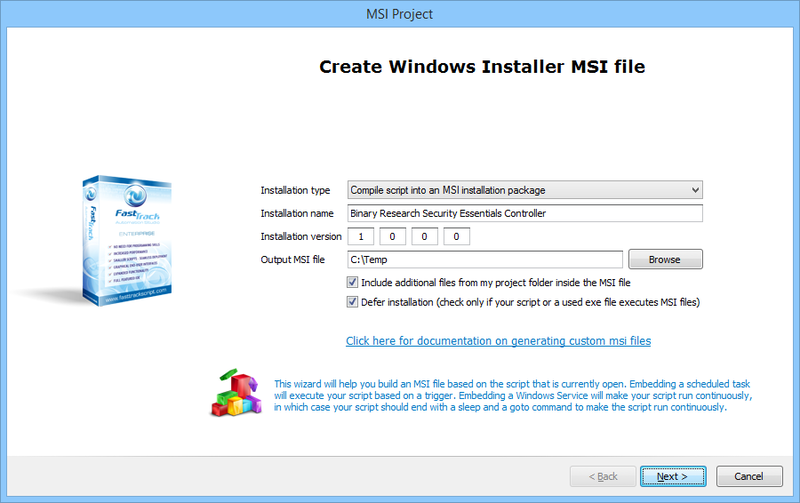 This is the controller MSI file that contains the Security Essentials installers. When successful, the complete page is shown. Notice how it displays a script that you can open in the Script Editor and edit. Essentially the wizard does nothing more than compile this script and your Security Essentials setup files as an MSI file. If you are not happy with the installation script or your need to expand it with, say licensing information, you can just open and edit the template script in the Script Editor and save it to the same folder as the Security Essentials setup files. You are now using the third box in the drawing above, where you build your own custom MSI package. This is explained in a more detail at the bottom. Note that if you used launch conditions, you will see that conditions were inserted at the top of the script, which is why it is a good idea to let the wizard create a template script, in case you need to extend or modify the functionality. That's it! You now have an MSI file that will install Security Essentials unattended, which you can now assign as a software installation to Group Policy (see screenshots below). As a general principle for Group Policy MSI deployment, you should check the uninstall option, to make sure that your MSI file will uninstall on all machines, if you remove the GPO MSI package. Similar articles exist for TeamViewer, MalwareBytes, AVG and Avast (click the links to see documentation). If you need to modify or expand the script generated by the wizard, you must check the "Create a new script using the above template" on the last page of the wizard and save it to the same folder as your Security Essentials setup exe file. Once you have modified the script to your needs, you must use the "Compile to MSI" option in the top menu. You check "Include additional files from my project folder inside the MSI file". You check "Defer installation", because Security Essentials uses two hidden MSI files as part of the installation. When you get to the page to select additional files inside the MSI file, make sure to check both your Security Essentials setup exe files. You also need to include the files "7z.exe" and "7z.dll" that the wizard created in your setup folder, as these are used to unpack the installer files during installation.